"Tales from Love & War"
Gracey Daylittle is an empathic pie maker with a unique kind of magic. Ever since she and her sis­ter found the Prime of Darkness lying uncon­scious on the side of the road, their lives— and their town— haven’t been the same. Marco Flores is an eight year old with a curi­ous menagerie of friends and an eerie con­nec­tion to the spirit world. Lilac & Lakmei Applewhite, a dis­turbingly sim­i­lar pair, have moved to town to rebuild the burned-down, his­toric church. The flick­er­ing light com­ing from their office win­dow never seems to go out. Like folks in any small town, their lives touch and inter­sect in innocu­ous but often pro­found ways. These are a few res­i­dents of the quiet, west Texas town of Love & War. And these are their stories. All's Fair in Love & War, Texas has not been tagged yet. 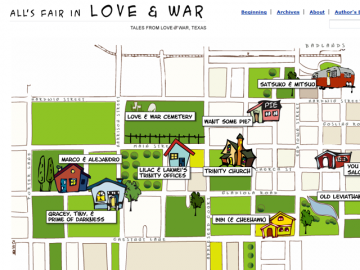 Help others find All's Fair in Love & War, Texas by tagging it! All's Fair in Love & War, Texas has not been reviewed yet. All's Fair in Love & War, Texas has not been recommended yet.